The park is on two levels. The entrance and most of the rides are on the top level, whilst the working studio and studio tour are at the lower level. We’d recommend heading straight for the Studio Tour when you arrive as there can be a long wait later in the day. Your journey is made on a specially constructed cart with a personal host who guides you through what you’re seeing. It’s a two fold experience because you see real ‘backlot’ areas of the studios, but also there are also movie ‘experiences’ based on films along the way. Your cart will be rushed with water at one point and you also enter a sound stage and become part of the set of Earthquake and the set comes apart around you. Bear in mind that when filming is taking place some areas of the backlot will be excluded from the tour. For us, this was the real highlight of the Universal Studios attraction and the other rides in the park were very much secondary. All of the rides are based on movies too, some are rollercoasters like the Mummy ride , some are flight simulators and some are cinema experiences like Shrek 4D. 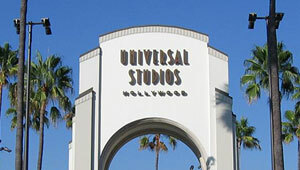 Universal Studios Hollywood’s opening hours vary from day to day, but typically it opens at 9am in the summer and 10am in the winter and closes between 5pm and 10pm depending on the day and time of year. Standard adult admission is $77 (2012 prices) but there are lots of extra options like ‘front of line’ passes etc. We recommend buying in advance here to save money.